We sell the highest quality sweets from around the globe, Sweet Lounge truly is a luxury sweet shop for grown-ups! Sweets imported from Italy, Belgium, Morocco, Turkey and more! We source gourmet chocolates that are made with the highest quality ingredients, for example our hazelnut chocolates are made using Piemonte hazelnuts, which are the finest in the world. The same goes for our Avola products, the Avola Almond is the best almonds in the world. We even have chocolates that are coated in real pure silver! Our packaging is designed clear...why? This is because we want all you lovely sweet tooths to know exactly what you're getting inside and because the sweets themselves have an amazing array of bright colours, shapes and features, so why would you cover all that up? Simplistic but elegant and smart looking, whether you're treating yourself or presenting this as a gift. Our biggest focus is to create packaging that can easily be recycled or reused. We care a lot about the environment and so we wanted our packaging and our brand to reflect this. Firstly we Love to save paper so we NEVER print and send invoices with your orders. But no receipt in your box is great if you're sending a gift. We Save Trees by not printing pointless invoices, as most of you probably know, you simply throw away the invoice when it comes next to your order. We have a brilliant system if returns need to be made, so again, No need for an invoice! However for business/individuals, if you require an invoice for your order, for VAT purposes etc, simply contact us. We are also a comapny that likes to be clear about our values, honest about our products and always happy to help no matter how big or small the enquiry may be. 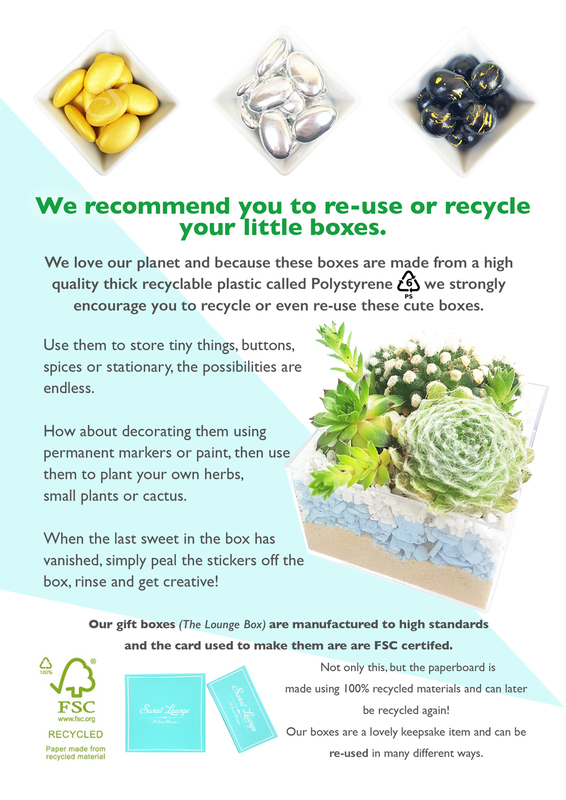 Everything from our packaging and gift boxes to our shipping boxes are easily recyclable . Our packet bags are made from polypropylene (PP) which is also recyclable. When you say the word 'Paradise' what does it make you think of instantly? The white sand beaches, crystal clear seas or that cheeky pina colada in the sunset. Which ever way you think of how this word pictures in your mind, its that paradise is sweet, relaxing and colourful. This is where the idea of Sweet Lounge and our motto 'A Sweet Paradise' came about, sweets are bright, colourful, sweet and something you can enjoy when treating yourself or others. Our brand colours also reflect the 'Paradise' concept so we named our company's colour 'Paradise Sea Blue' as it's not just a generic blue or turquoise, it has a deeper meaning. 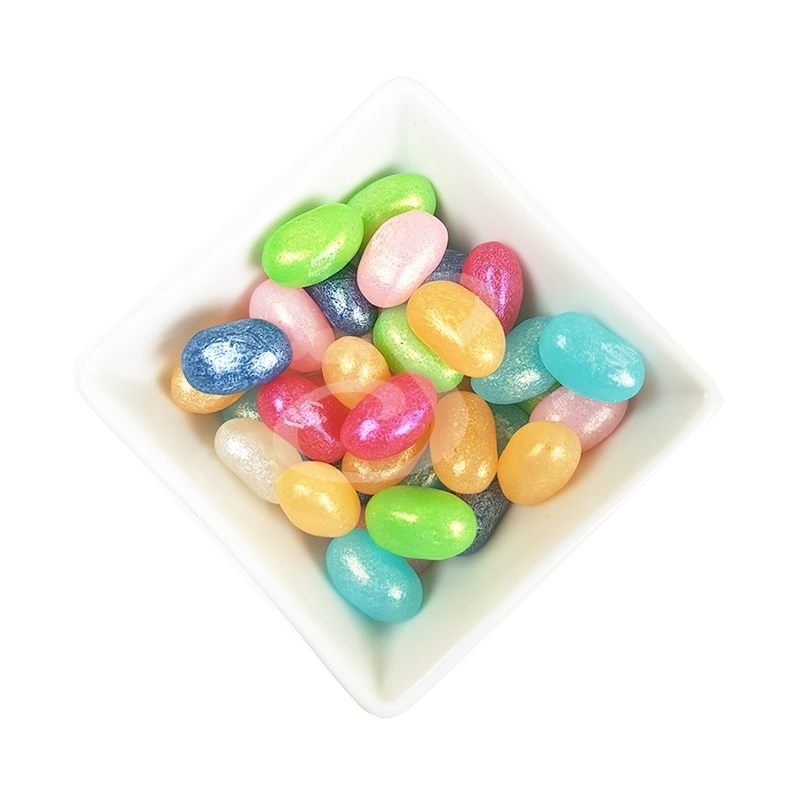 We specialise in Vegan, Vegetarian or Halal and Kosher Certified Sweets ONLY. So we wanted to make it even easier to shop by separating these sweets into these main categories, also to make it clear whether the product is suitable for you. Underneath the product title on the products dedicated page we have a short but sweet way of quickly identifying if this product is suitable, we label out if the product is Vegetarian, vegan, gluten free or certified in any other way. Each packet/box that we send to you are labelled with the full list of ingredients and expiry date. 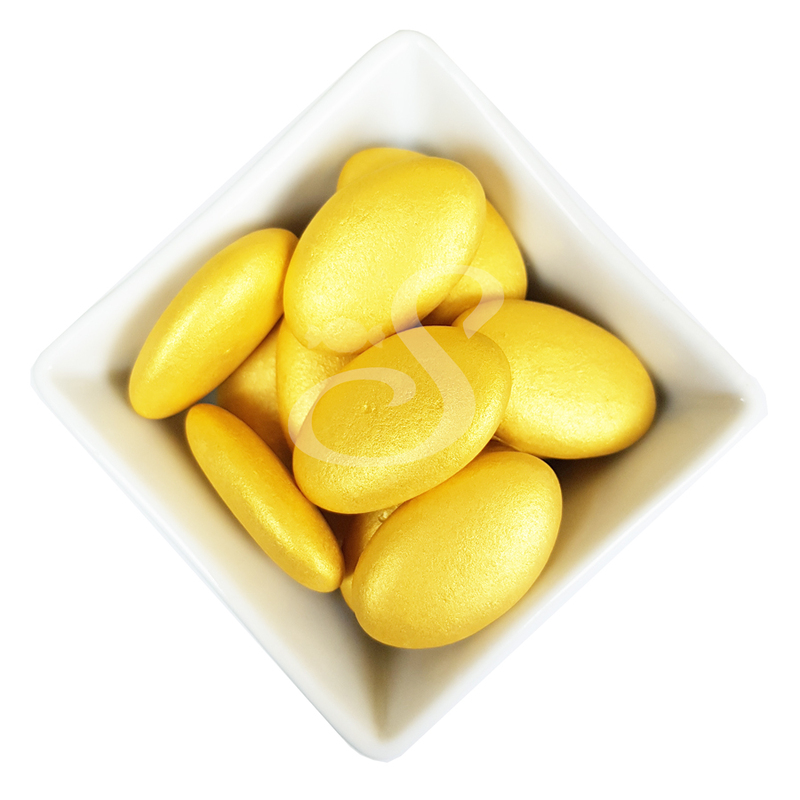 We only provide you with the highest quality sweets and chocolates. Each parcel is tracked, so you know exactly where your sweeties are. All of our products are either Halal Certified or Suitable for vegetarians or vegans. So sit down in our Sweet Lounge, and enjoy A Sweet Paradise. Young Entrepreneur Greta started doing business at just 16 years old, whilst doing and completing her A-levels at the same time! It all started off with an online flower shop, which she opened for her dear mum (who was tired of not being able to what she loves!) after just 9 months she opened a local florist shop which is now run by Greta's mother and her sister. Greta also done professional photography whilst running the online business, became a multi-award winning young entrepreneur and appeared in local and national newspapers and was a speaker for business on the radio. After completing her A and AS studies she had to make a life changing decision...univercity. It was a difficult decision to take when it came to university, but after a long hard think, it just wasn't for her, business was her passion, so why not continue that success and continue along this path. And so Greta decided to move on to something else, but she never thought it would be sweets! And from there, Sweet Lounge was born. Now 21 years old, Sweet Lounge is running from a larger premises, with some part time staff and packing sweets for companies such as Samsung is more than what she ever imagined.